Having Kids: Sometimes The Answer Is Just "No"
My friend Jamie* wants you to know she doesn't hate children. That's not why, at age 24, she decided to get sterilized. She's "just always known" she didn't want to have kids herself; she says, "I think it's just something you can know." She's also aware that not everyone understands why a woman her age would want this procedure, so when a Jezebel reader requested a post on sterilization for younger women, she was happy to talk to me about her experience. 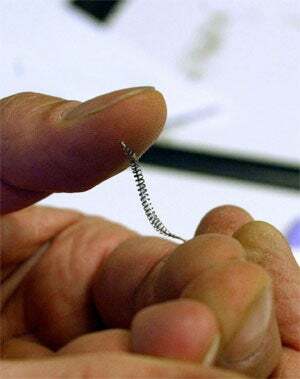 Turns out "getting fixed," as she calls it, was actually the easy part.Jamie didn't want surgery, but when she heard about the less invasive Essure, a metal coil that creates scar tissue in the fallopian tubes, she was intrigued. She did a lot of research, especially on post-sterilization regret, which for young women seems to be greatest if you've already had children. Then she met with a doctor who she feared would turn her away because of her age. He did ask her a lot of questions (including the rather offensive, "What if you met a billionaire who wanted to have kids with you? "), but he eventually approved her for the procedure. I drove her to the appointment and waited at the clinic while she had the device inserted. I won't say it wasn't a weird experience — the clinic also did cosmetic surgery, so it was kind of a palace, and I sat there reading Vogue while my friend got screws shoved up her reproductive organs. For her part, she says it didn't hurt at all. They did have to dilate her cervix and pump her uterus full of water, so she came out a little nauseous and tired, but in good spirits. The real fallout came when she told her parents. Her mom cried, and asked why she couldn't "just let her life unfold" the way other people did. Up to that point I'd been totally on board with Jamie's decision, but her mom's tears gave me a twinge of doubt. I wondered if I'd helped her carry out a choice she'd later regret. But Jamie tells me she doesn't even think of it as a choice. When a gay friend of hers found out about her parents' reaction, he told her it sounded a lot like coming out. She was revealing "an important fact about who she was, that couldn't be changed, and her parents didn't want to accept it." She believes the desire not to have children can be something innate, as basic as the urge to procreate. On the question of kids, she says, "sometimes the answer is just no." Her parents aren't the only ones who disapprove. Even the nurse at the clinic assumed Jamie was "done having kids," and was taken aback when Jamie explained that zero was enough for her. Jamie says most people see not wanting kids as a function of youth, not a deeply held conviction. When I asked how she felt about explaining her sterilization to people, she told me this: "Does it need to be defended? No. But people will feel entitled to an explanation, and you can get mad about that, or you can think of something to say." Which seems pretty good way to think about any big decision in your life, especially if it sets you apart from what people think of as normal. *Not her real name.